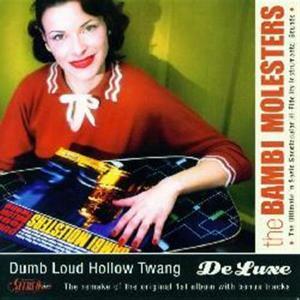 Formed in 1995. under the influence of 60's garage and surf classics, Croatia based band THE BAMBI MOLESTERS won sympathies of rock critics and underground rock audience with their first album 'Dumb Loud Hollow Twang' which was released in 1997. by a small independent label ' Dirty Old Town'. The whole album, all 15 original songs were recorded in unbelivable three hours. Produced by the legendary californian surf DJ, Phil Dirt, and although it was later licenced to Kamikaze rec. from Germany, the album soon went out of print. The songs from both albums were regularly played on American (KFJC, KFAI, XLU,WREK, WHUS) and British (BBC RADIO 1) radio stations. Their song C Alpha E was included in the soundtrack of the movie called 'The Treat' by Jonathan Gems (screenwriter for 'Mars Attacks' and '1984'). THE BAMBI MOLESTERS music can also be heard in videos ('Cross Cuts' for Tonix Pictures and Dragonfly BMX video). 3 songs from the first album are included in the movie 'Barabe' (Viba film, Slovenia). In 1999. among their other shows, they supported R.E.M. for the first time, in Koper, Slovenia. In December 2001 THE BAMBI MOLESTERS released their 3rd album 'Sonic bullets: 13 From the Hip'. It was recorded in a Slovenian top-quality studio, RSL Production in August 2001., and again released by Dancing Bear label and later on ( in June, 2002.) released for the European market by Big Beat ( a subsidiary of ACE records from London). This album features Peter Buck (R.E.M. ), Scott Mc Caughey YOUNG FRESH FELLOWS, R.E.M. 's touring band), the WALKABOUTS frontman Chris Eckman, Terry Lee Hale, American singer/songwriter and Speedo Martinez, singer of the fabulous THE FLAMING SIDEBURNS. It was produced by an award-winning Croatian producer Edi Cukeric and mastered by Ed Brooks (RFI/CD Mastering, Seattle, USA). Promo shows followed the release of the album, as well as a number of Croatian discography awards. Album was reviewed in MOJO magazine, UNCUT magazine, Pitchforkmedia etc. In February 2002. The Bambi Molesters went to New Zealand to play at the New Zealand festival. One of the 6 shows they did in Wellington was recorded live and broadcasted on the New Zealand national radio. 'Sonic Bullets: 13 From the Hip' album also won Croatian discography award, and three independent music awards. In the spring 2002., Dalibor did a soundtrack album for a Croatian movie, and was awarded national film award for best original soundtrack. First eight months of the year 2003. were spent mostly on the road. They played Germany, Italy, Switzerland, Spain, Austria, Slovenia, and Croatia, one of the shows being the Orange Blossom Special -Glitterhouse rec. festival in Beverungen. In July The Bambi Molesters supported R.E.M on three shows of their European tour (Locarno-CH, Wien-A, Wiesbaden-D). Immidiately after the touring stopped the band went to studio to record their first album again, rearranging some of the songs, and adding bonus tracks. The so-called remake of their out-of-print album is named ' Dumb Loud Hollow Twang - deluxe' and was released in December 2003. by Dancing Bear Records. A bonus DVD featuring documentary about the band, 'The Bambi Molesters Backstage Pass', directed by Gonzo, that includes footage shot 1999-2003. (covering band's different shows as well as Bambi Molesters' R.E.M. support act) was exclusively added to this release. In January 2004. The Bambi Molesters joined forces with Chris Eckman and Phil Brown (engineer and co-producer - www.tape.demon.co.uk) in the Slovenian studio Metro in Ljubljana where they recorded a collaborational album scheduled for release later in the year.